Here are some highlights of 10 years producing instrumental music, primarily for my own pleasure and pastime. After several years playing in various bands with failed aspirations to make the big time, the advent of relatively cheap technological tools presented the opportunity to go my own way. So, off I went into my own musical world, that for close to a decade consumed me to the point of becoming almost a full-time occupation (in time, if not money terms). Click on the track title to listen. Please note: prohibitive costs restrict the tracks to approx 1-minute samples. 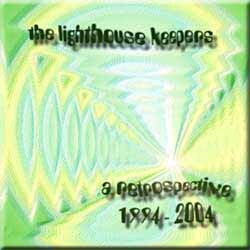 Notes: This was (I think) the first complete LKs track I produced - strongly influenced by jazz-funk-fusion saxophonist (and composer of the "Starsky and Hutch" theme) Tom Scott. Notes: For better or worse, when I composed this my only real exposure to Latin music was via the Latin-Rock fusion of Santana, rather than authentic Cuban or Brazilian music (which I later studied). Notes: I grew up with 70's disco music, then left it behind for a while. By this time I was getting back into it again. Notes: This was a semi-improvised experiment in creating music for an imaginary sci-fi-type film. The breakdown at the end was a complete fluke whereby my sequencer couldn't cope with all the data and crashed - I couldn't have planned it better. Notes: Unlike most of these pieces, this was originally built around a riff I came up with on bass guitar, with the intention of being a "proper" song: I even had some lyrics drafted. This is the sequenced demo: I never got around to finishing it off. Notes: A college assignment: one of several variations on a theme produced to accompany fellow students' video presentation. This one is an homage to the "Bond" music. Notes: Produced almost spontaneously, the motivation here was a would-be theme tune for a Channel M/Salford University Chat Show (the template was the "This Is Your Life" theme). I never got around to submitting it for the show, but used it in my final year composition portfolio. Notes: The good news was that I entered this assignment (conceived as a backing track for an imaginary cartoon) for the Salford University "Elgar Howarth Composition Award" and won. The bad news was that no-one else entered. Part of this is directly cribbed from a David Bowie track - guess which? Notes: Featured in my final year composition portfolio at Uni, this is part of another suite that was "commissioned" by a film student. As an exercise in meeting a tight deadline, I deliberately left things until the night before it was required. Then forearmed only with a 4 note motif I had in my head, prepared several minutes of variations on a theme...it was completed around 5am in the morning. I never did see the film. At this point I was getting heavily into the retro-easy revival of Burt Bacharach, Tony Hatch, et al. Update: This piece was actually featured in this film that got a commercial release (and my name appeared in the end credits), but sadly I haven't seen a penny from that either (and never will), but that's the way of the world these days. Still, I can live in hope that maybe one day some rapper or other will sample one of these tunes, and then I can sit back and watch the money roll in ha ha! Notes: Knocked out specifically for the below compilation. I didn't have the facility to use keyboards so used Cooledit (sound-editing program) to put together a montage of treated sound samples from other LKs material: the concept was inadvertantly suggested by what I had originally flung together in an ad-hoc manner. All tracks on this page composed, arranged, performed, and produced by G Underhill, except *produced by G Underhill and M Hutchings. 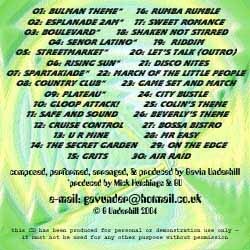 All tracks on this page © Gavin Underhill - not to be re-used without permission of the author.